Cubist villa in Libušina Street 3/49, Prague -Vyšehrad, Designed by Josef Chochol, built 1912-1913. My favourite cubist house from the cubist buildings below Vyšehrad, the borough of Prague 2. In its era, cubism was one of the most avant-garde artistic styles, but also among the most broadly publicly questioned. Today, the passions have cooled and cubist works are admired by thousands of visitors in the most renowned galleries. A uniquely Czech phenomenon is that cubist ideas were transferred from art into architecture. Purely cubist buildings cannot be found anywhere else in the world. Certainly the most famous cubist building in Prague is Gočár’s building “At the Black Madonna”, built in 1912 on the corner of Celetná Street. But true cubist gems can be found below Vyšehrad Castle. 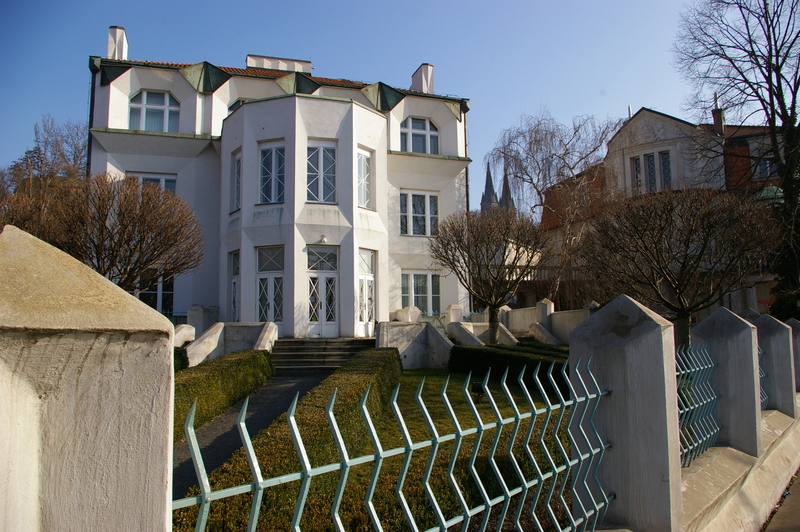 Between 1912 and 1913, the famous architect Josef Chochol built a cubist triple villa on the Rašín Embankment, bearing the house numbers 71, 47, and 42-VI. The prominent cubist facade, windows in deep niches, and the pronounced plastic ledge are truly captivating. In the same spirit, Chochol also built the famous villa at 49-VI Libušina Street. Compared to the triple villa, the structured façade is calmer and entirely harmonious. A true jewel of cubist architecture is the apartment building No. 98-VI on the corner of Neklanova and Přemyslova Streets. The building was built by builder František Hodek between 1913 and 1914. Although the apartment building did not offer room for formal premises that would allow the cubist approach to develop, we find extraordinary architectural features there, for example the entrance hall with an original cubist vault. The high artistic standard of the cubist façade has led to the generally accepted assumption that the building was also designed by architect Chochol, but there are no direct written documents to prove that. No lover of our city should miss the opportunity to see the unique marvels of cubist architecture, so admirably married with the tradition and spirit of the area below the ancient Vyšehrad Castle. This entry was posted in Architecture and tagged Architecture, buildings, cities, City, cubism, cubismus, cubist, cubistic, CZ, Czech Republic, Europe, exteriors, folly, House, kubismus, mansion, outdoors, Prag, Prague, Praha, town, Travel, travelling, Urban, vila, Villa, Vysehrad. Bookmark the permalink.